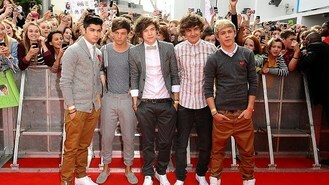 Members of One Direction are to co-host a show each on Radio 1 next month as they take over the airwaves for 10 hours. They will join regular presenters throughout October 6 ahead of the station's Teen Awards, selecting the music and taking calls. New breakfast show presenter Nick Grimshaw will be teaming up with his pal Harry Styles from the What Makes You Beautiful quintet when they do a two-hour stint from 10am. To begin the day, Gemma Cairney will be joined by Liam Payne at 8am, while Scott Mills co-hosts with Zayn Malik from noon. Huw Stephens takes a turn with Niall Horan at 2pm, handing over to Greg James and Louis Tomlinson at 4pm for the last of the two-hour shifts. The group - soon to release new single Live While We're Young - will also be creating their own features for their shows. One Direction will headline the Radio 1 Teen Awards - honouring inspirational teens and stars from entertainment and sport - at Wembley Arena the following day. Nick will host the event with performances from Conor Maynard, Taylor Swift and Little Mix. Jennifer Aniston and Mad Men star Jon Hamm have helped belt out a rendition of The Beatles' hit Hey Jude. Moon River singer Andy Williams has died aged 84. Mumford And Sons have declared that their current success is "a bit of a dream come true". Adele's song for the new James Bond film will be called Let The Sky Fall, it has been suggested. Jessie J has insisted that she will return for the second series of The Voice. Usher has pulled the plug on his UK and European gigs after landing a role as a coach on the US version of talent show The Voice, and being given the care of his two sons. Katy Perry has been named Billboard's Woman of the Year. X Factor finalist Janet Devlin is set to perform at this year's The X Factor ChildLine Ball.